I don’t know what you think, but I believe that God intervened in the election last week. I’m not sure if that is good or bad, but like so many other things in life, it depends on your perspective. Either way, God did something big in America. Some say the election of Donald Trump was a blessing from God. But you will find many Christians say that his election was the judgment of God. Some think Trump will save America while other concerned believers think that The Donald will destroy America. Was his election a blessing from God or was it a curse from The Almighty? Time will tell…but there is no doubt that His hand was stirring something on the evening of November 8, 2016. As I wrote a couple of weeks ago…only the Church CAN MAKE AMERICA GREAT AGAIN. But the church is going to have to deal with some very serious issues in the days ahead. The statistics show that we are running out of time. If we do not immediately wake up and change the way we are doing things, the America that turned out all across the heartland will soon be a thing of the past. The Baby-Boomers are rapidly aging and one can only imagine how many voters cast their last ballot in a Presidential election last week. Four years from today hundreds of thousands of the “deplorables” who pulled the lever for Donald Trump will either be dead or in a nursing home. Nearly 10,000 Baby Boomers die each day. That is 3,650,000 dead per year which means 14,000,000 will not make the election of 2020. Recent statistics show that there are approximately 74,000,000 Baby Boomers still alive. If my math is correct, over the next four years the number will fall to 60 million. The Millennials, those born in between 1980-2000, number 84,000,000. Today, in America, there are more of them than there are of us. Baby Boomers and their values are slowly fading away. Why does that matter you may be asking? Well, demographics can be a scary thing. The Baby Boomers are the last generation of Americans to grow up in what was generally considered a Christian nation. Although in America today 71% of the citizens claim Christianity as their religion of choice the reality is that the percentage of the population that identifies as “Christian” is in a free fall. Just seven years ago the same statistics showed that 78% self identified as Christians. Barring a spiritual revival, as the Baby Boomers die off those percentages are sure to plummet. This is no longer your grandparent’s America. We Baby Boomers were the last generation to grow-up in a nation where the public schools included Christianity and Christian values as fundamental teachings taught to every child. Since the removal of prayer in 1962, the elimination of Bible readings in 1963, and the removal of the 10 Commandments from the walls of the public schools in 1980, Secular Humanism has been substituted as the religion of the nation. As a result, the influence of Christianity, and Christian churches has waned dramatically. Today, in the public school where your grandchildren attend, Christianity is nearly banned. The god of government and the god of self has now become the religion of the average American citizen. Perhaps nothing more illustrates this issue than two maps from the recent election. 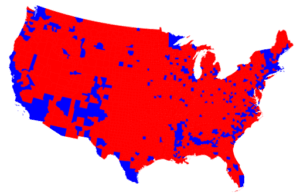 The map below, county by county, is flooded with “Red” which reflects the influence of the Baby Boomers who turned out massively in the election of 2016. 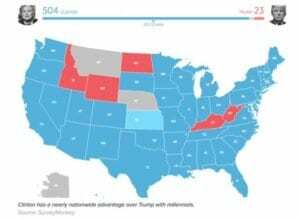 Although not scientific, the second map below shows support for Hillary from the Millennials. 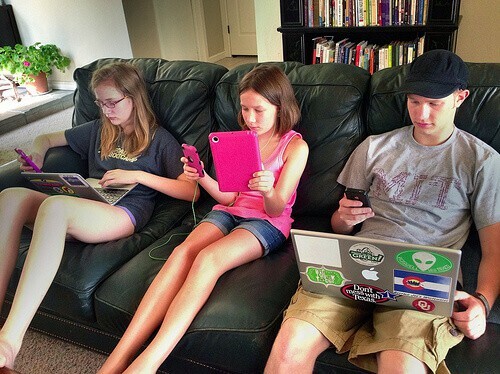 It would appear to me that the grandchildren do not share the values of their grandparents. How has this happened and what can we do about it? What is the common factor that over 90% of Millennials share? Public schools are where the values of the grandparents are torn from the hearts of their grandchildren. It is time for religious leaders, pastors included, to call for a mass exodus of Christian children from public schools. We can no longer stick our collective heads in the sand and deny the negative influence that Humanistic indoctrination has had on this nation. Our failure to educate America’s children in Christian values and Christian morality will be the death knell of liberty in this land. We are running out of time. Our children are our future. We must fight back and fight back now. Thousands of church buildings lay empty throughout the week. It is time to populate them with young children. Our churches are full of retirees who could volunteer to help with the education of the community. The internet is full of Christian home-school materials at the click of a mouse. The church should be the center of ALL learning for the young children in the community and education does not have to be expensive. Failure to pass Christian values to the next generation will be deadly to our nation. Christian education should be our number one focus. It is a task every church can do. Churches in the community can partner together to create home school co-ops where mothers and grandmothers labor daily to raise the next generation of Christian citizens. Take a good look at the two maps posted above. Public education is dividing the generations. We are told in Proverbs that “A good man leaves an inheritance to his children’s children.” It is not money that we are talking about here. The inheritance is values, culture, and a way of life. Public schools are stealing our inheritance. We must act and act now. Why are we surprised that when we send our children to be educated by Caesar that they end up becoming little Romans? Why do we pay for public schools that don’t teach the values of the public? Stop waiting on Washington to change. Start changing things in your church. Stand up and take the initiative. Don’t wait for the pastor. Get an educational program started in your church!! You can do it!! The kids in your community are counting on you! !